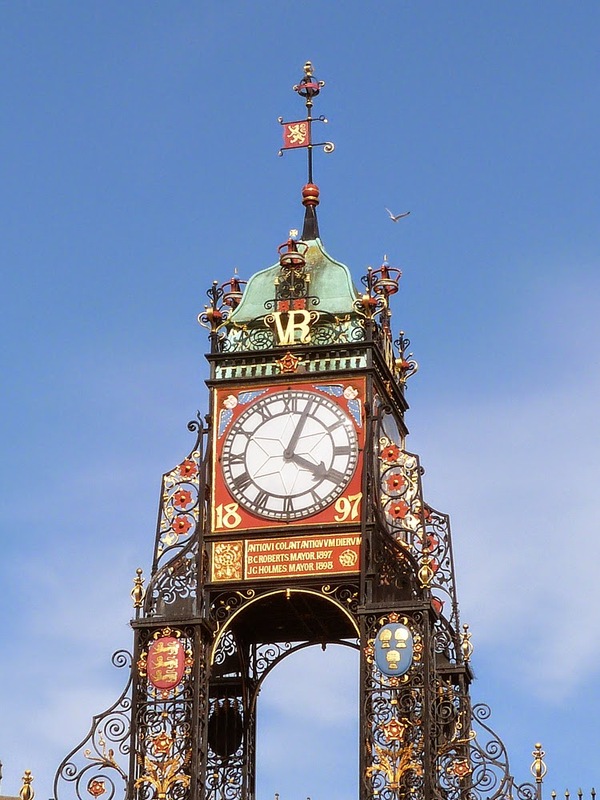 The Eastgate Clock in Chester is said to be the most photographed clock in England after Big Ben! It was added to Eastgate in 1899 to celebrate Queen Victoria's diamond jubilee in 1897. The clock has four faces - this is the west side and the inscription (if you can't make it out!) reads "ANTIQUI COLANT ANTIQUUM DIERUM: B.C. ROBERTS, MAYOR 1897; J.C. HOLMES, MAYOR 1898". Eastgate forms part of Chester city walls, and was built in 1768 on the site of the original entrance to the Roman fortress of Deva Victrix.